It's late Friday night, you're stepping out of the bar into the cold after a few drinks, and as you head towards the car, you stop, realizing that it might not be the right time to drive. But how can you know for sure? Simple -- you just pull out your iPod. 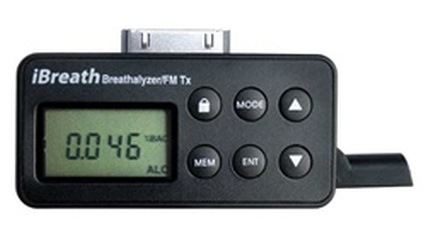 Because the iPod hasn't had enough random things attached to it, there's the iBreath, a breathalyzer that connects to the bottom of your iPod or iPhone and will not only tell you what your BAC is, but transmit your iPod's audio to your FM radio as well. You've gotta be kidding us. Not only should you never drive after drinking, as even legal levels can be dangerous, but even if you just want to know your BAC you can buy a regular breathalyzer for a lot less than the $80 this one costs, and you don't even need an iPod to connect it to. But we'll give these guys their credit -- of all the things you can attach to an iPod, this one might be the strangest. TUAWiBreathalyzer is, yes, a breathalyzer for your iPod originally appeared on The Unofficial Apple Weblog (TUAW) on Thu, 18 Dec 2008 17:00:00 EST. Please see our terms for use of feeds.